Review Source: copy provided by publisher in exchange for an honest review. Note: While this review will be spoiler free it may contain spoilers for the first book in the series. Check out our review of In a Fix. Quick Fix, the second installment of the In a Fix series, sees the return of Ciel and her delightfully confusing body-swapping ways. When working a job for a client at the Zoo, Ciel’s 10-year-old ‘cousin’ Molly accidentally adapts into an orangutan. Not only is it highly usually for a child that young to be able to take on auras but it’s supposedly impossible to change into animals. As if figuring out how to change her back (and keep it from their mothers) wasn’t enough to be dealing with, something big is brewing in the CIA adaptor group. When human agent Laura is shot Billy (Ciel’s pseudo-cousin/possible-boyfriend-if-they-ever-get-a-chance-to-figure-that-out) is the prime suspect. Ciel refuses to be believe this is true and the fact her brothers are trying to keep her out of the loop just proves it. Fed up of being kept in the dark, Ciel’s hell bent on getting some answers and she doesn’t care who she has to look like to do it. For much of the book the two plots of Molly’s predicament and Laura’s shooting felt very separate but as the story continues they weaved together really well. Ample amounts of action and mystery still get Ciel into plenty of trouble but for me the world building and relationships stood out in this installment. 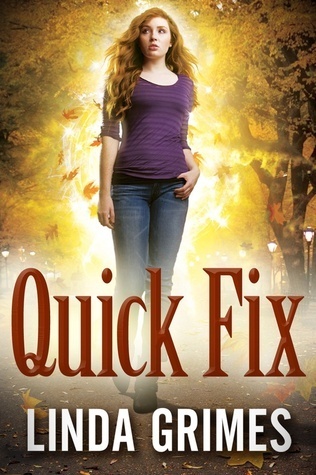 Through Molly’s unfortunate transformation the world building expands in Quick Fix. James, Ciel’s only non-adaptor brother, has dedicated his scientific career to learning more about the adaptor gene and sets out to help Molly. His research provides tons of information on just how the adaptor gene works, when and how it manifests and what it’s like to grow up with it. But he also shows just how tough it is for non-adaptor children to grow up on the outside looking in. While the first installment focused on Ciel’s job as a Facilitator, here there is much more of a family vibe. With three brothers, countless cousins and mothers that make them all shake in their boots, there was an almost Weasley-esque feel to the family dynamics. There’s shouting and bickering, schemes and so much love that it shines off the page. Add in the ability to ‘turn into each other’ and you have some hysterical moments. Ciel is still utterly confused when it comes to Billy and Mark. She doesn’t have much experience with romance and finds her sudden attraction and relationship with Billy hard to adjust to. While it was clear to me that she was just struggling to let go of her childhood crush on Mark (that and I though he was a bit of a douche), I actually quite liked the love triangle element. It felt genuine to her, giving her character an opportunity to grow. Once again Linda Grimes manages to mix science fiction and a spy-worthy plot, with health doses of humor and romance. The fact that you’re never one-hundred-percent certain people are who they say they are keeps you constantly on your toes, making Quick Fix just a downright fun read.